This category covers special trade contractors primarily engaged in masonry work, stone setting, and other stone work. Special trade contractors primarily engaged in concrete work are classified in SIC 1771: Concrete Work; those engaged in digging foundations are classified in SIC 1794: Excavation Work; and those engaged in the construction of streets, highways, and alleys are classified in SIC 1611: Highway and Street Construction, Except Elevated Highways. The masonry, stone setting, and other stone work industry includes the laying of cement blocks and bricks, chimney construction, and stone and marble work, both utilitarian and decorative. While some contractors use techniques in existence for centuries, others rely on the latest advances in method and machinery. For example, buildings of rough stone or brick remain dependent on construction techniques developed thousands of years ago, while the cutting and polishing of stone was accomplished in the early 2000s with highly accurate and sometimes electronically controlled machinery. As a business, masonry remained a relatively small part of the construction specialty trades group. Masonry contractors often worked as subcontractors to general contractors on construction projects, but some also worked for the facility owners on repair and maintenance jobs, or on projects such as the installation of a new marble floor in an old building. Masonry contracting establishments are considered offices managing work at one or more constructions sites. While some of the larger masonry contractors serve customers from several offices over a wide territory, most firms are relatively small, privately or family-owned businesses serving local customers. Most masonry work is performed by specialists, with only about 6 percent contracted to firms primarily engaged in other construction specialties. Furthermore, some masonry specialists limit the scope of their business to specific materials such as brick, cement blocks, or stone. One of the largest masonry firms, The Western Group, works primarily in restoration and renovation projects. Masonry contract work is done on a variety of structures. According to the latest figures available from the U.S. Census Bureau, the industry is broken down by revenue as follows: single-family houses (26.0 percent), office buildings (12.5 percent), stores, restaurants, and gas stations (12.5 percent), industrial buildings (8.7 percent), schools (6.2 percent), apartment buildings (5.7 percent), houses (5.4 percent), hospitals (3.9 percent), other institutions (3.6 percent), warehouses (3.5 percent), heavy industrial facilities (2.2 percent), churches (2.0 percent), and other construction (7.8 percent). Of the total construction amounts, about 76 percent represented new construction, 24 percent additional alterations or reconstruction, and 10 percent maintenance and repair. Masonry contracting companies all performed the necessary business functions of marketing, estimating, planning, scheduling, purchasing, accounting, and training. Since most contracts were secured on the basis of competitive bids, the estimation function was regarded as one of the most important in the business, requiring special skills and experience. Bids that were too high resulted in losing contracts to competitors, whereas jobs bid too low could result in losses for the contractor. Masonry was also subject to national, state, and city building codes, which required the full understanding and compliance of the masonry firm management and technicians. In the early 2000s, payroll represented the main cost of operating masonry contractor businesses, representing roughly one-third of total revenues. The cost of building materials represented another one-third, and work subcontracted to other firms represented less than 10 percent of revenues. The balance went toward overhead and administrative costs. Masonry had its origins in Mesopotamia around 4000 B.C., when mud or clay bricks were used in construction. In Egypt, around 2600 B.C., cut stone was introduced in the construction of religious facilities and monuments. These early stone works exhibited remarkable engineering skills as they included stone pieces of several tons in size which were fitted with exacting tolerances. In the Americas, dry stone construction was also used, primarily for religious edifices, by the early Aztec, Mayan, and Inca civilizations. The Romans brought several innovations to stone construction techniques. They used mortar extensively and developed vaults and domes in large structures with buttresses to reinforce large-scale buildings. These features were later incorporated into Gothic cathedrals, which represented an unsurpassed artistic achievement in masonry workmanship. The development of steel and reinforced concrete in the nineteenth century rendered stone arches and vaulting obsolete and led to the development of the modern skyscraper. In the twentieth century, the most common masonry application involved the use of concrete blocks, which proved both economical and durable. Moreover, concrete blocks provided excellent insulation against extreme temperatures and noise, were fire-resistant, stood up well in earthquakes, and needed little maintenance. In the United States, an industry standard developed in which concrete blocks, with mortar, measured 8 inches by 8 inches by 20 inches. Much of the stone used in American masonry projects—granite, limestone, marble, sandstone, and slate—was purchased from foreign sources, and a lesser amount of stone quarried in the United States was sold overseas. In 1991, domestic stone production was valued at $197 million, with the following six states as the highest producers: Georgia, Vermont, Minnesota, North Carolina, Texas, and Indiana. Stone imports for domestic use that year were valued at $475 million, with Italy serving as the source of about half the worldwide stone production. A booming U.S. construction industry revitalized the masonry industry in the late 1990s and early 2000s. Not only were homes being built at a rate unmatched in 25 years, buyers were also demanding more upgrades that required tile, stone, and brick in their new homes. The industry employed 165,000 workers in 2002, and employment between 2002 and 2012 was predicted to grow 17.4 percent. Average hourly wages for stonemasons were $16.36 in 2002. Brickmasons and block masons earned an average of $20.11 that year. The early 2000s were not without trouble for masonry contractors, as well as for other construction specialties. The U.S. economic slowdown caused high office vacancy rates, which slowed office construction. At the same time, a slowdown in manufacturing pushed industrial and warehouse construction down as well. However, analysts predicted that commercial and industrial construction would rebound as early as 2004 thanks in part to the passage of the TEA-21 Reauthorization Bill, introduced by the House Transportation and Infrastructure Committee, which earmarked funding for masonry structures. 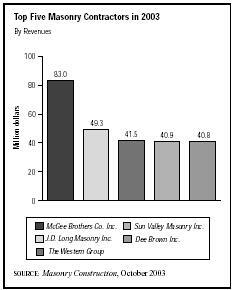 The industry leaders as of 2003 included McGee Brothers Co., based in Monroe, North Carolina, which posted $83 million in masonry sales, 80 percent of which were residential. In a distance second place was J.D. Long Masonry Inc., based in Lorton, Virginia, with sales of $49.3 million. St. Louis, Missouri-based The Western Group, secured sales of $130 million, $41.5 of which came from masonry operations. Western employed 1,000 workers in 2003. Close on Western's heels were Sun Valley Masonry, located in Phoenix, Arizona, with $40.9 million in sales and Dee Brown Inc. of Garland, Texas, with $40.8 million in sales. Steeped in centuries of tradition, masonry work required specialized skills and often, artistry. The homes, cathedrals, and other buildings masons helped produce prompted a high esteem for the profession and many masons derived considerable personal satisfaction from their creative efforts. was also available through on-the-job guidance by senior, experienced masonry craftspersons. In the early 2000s, construction workers comprised the majority of the industry's work force, while about 10 percent performed a broader rage of business functions including estimating, engineering, planning and scheduling, purchasing, material control, and accounting. Although some seasoned masons had a broad range of skills and experience, from laying cement blocks to carving or repairing stone ornamentation, most specialized in one skill. Considerable physical strength was required for laying cement blocks, while stone work was more precise and therefore, required more patience and an eye for detail. Most masonry contractors' employees are members of the International Union of Bricklayers and Allied Craftsmen. Others belong to the Laborers International Union. Both unions are affiliated with the AFL-CIO and membership remains particularly strong in urban areas. While some of the larger masonry companies had branch operations throughout the United States, few were engaged in business on a global scale. American general contractors that performed construction overseas generally subcontracted work to established local masonry firms or acquired foreign operations near the job site. Foreign general contracting companies performing construction work in the United States were more common. Several masonry methods and techniques led to changes in the industry. The development of modular stone wall panels for high-rise buildings, which consisted of steel frames, anchoring devices, and stone, glass, and other exterior materials, made construction of walls more speedy and economical. The modular process also enabled the use of thinner stone panels, leading to lighter and less costly materials. An injection system for applying epoxy—used to secure threaded rods to reinforced brick masonry walls—helped make the walls better equipped to withstand the effects of an earthquake. Moreover, aqueous silicon solutions were introduced to new water repellents to help prevent damage to walls from the freezing and thawing of absorbed moisture. Improved durability in concrete was achieved by adding supplementary materials made from industrial by-products, thereby conserving natural resources. Technological developments also resulted in using robots in the industry for excavating, pipe mapping, and building masonry walls and wall partitions. Holzhauer, Ron. "Masonry Construction's Top Contractors" Masonry Construction, October 2003. U.S. Bureau of the Census. 1997 Economic Census. Washington, DC: GPO, 2000. Available from http://www.census.gov . U.S. Bureau of Labor Statistics. 2004-05 Occupational Outlook Handbook. Washington, DC: 2004. Available from http://www.bls.gov/oco/print/ocos201.htm . U.S. Bureau of Labor Statistics. Employment Statistics. Washington, DC: GPO, 2000. Available from http://www.bls.gov . Yelton, Rick. "What Will Be the Economic Sailing Conditions in 2004?" Masonry Construction, November-December 2003.